The globins are the protein products of a large and ancient multigene family, including the alpha and beta globins of hemoglobin (image left) , myoglobin, and even the leghemoglobins of plants. The common function of the globins is to bind oxygen. The sequences represented here are all beta globins. Functional hemoglobin contains two molecules each of the alpha and beta globin chains. The juxtaposition of the four chains, each of which can bind an oxygen molecule, allows hemoglobin to adjust its oxygen-binding capacity according to the oxygen concentration of its environment. It is beta globin that is altered in human sickle-cell anemia and thalassemia. In sickle-cell anemia only one amino acid of 146 has been altered, while in thalassemia, the amino acid sequence is terminated prematurely. Both alterations lead to changes in folding pattern that severely alter the function of the molecule. In the normal folding pattern the six helical regions of the molecule are folded into a single compact domain. 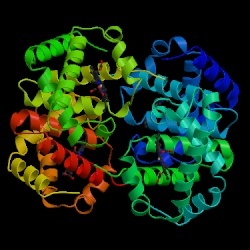 The folded protein encloses the iron-containing heme group to which the oxygen is bound. There are two versions of beta globin that can be heard here. One is the piece composed by John Dunn for the CD Life Music. In this setting, the beta globins of four mammals are represented: human, whale, bat and echidna (an egg-laying mammal). The piece begins with a human voice reciting the amino acid sequence of the protein. The names of the amino acids fade and are gradually replaced by their corresponding tones. The human and whale sequences dominate the piece, with counterpoint provided by the sequences of the other two species. The use of both speaking and singing human voices to represent parts of both the human and whale sequences underscores the similarities in their respective blood proteins. The second beta globin was set by M. A. Clark, using John Dunn's recently developed BankStep program. This composition was a simple etude and consists of two slow readthroughs of the protein over a background of low strings that play out the encoding DNA sequence. Several features of the protein are represented by different voices. The alpha helical regions that constitute much of the protein are played on harp, punctuated by a high chime that marks the turns. Overlaid on this are two additional voices, high strings playing the more soluble amino acids alternating with oboe playing the lower solubility amino acids of the protein's core. The two voices overlap for amino acids of intermediate solubility.